By 1999, the Georg von Holtzbrinck Publishing Group's many companies and subsidiaries had created hundreds of public Web sites. 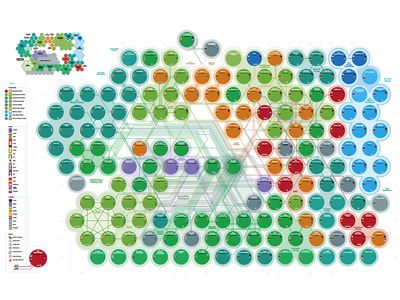 Dynamic Diagrams undertook a comprehensive study of these sites, giving Holtzbrinck a benchmark to use for its future Internet strategies. The study included all divisions, products, and joint ventures of Holtzbrinck for which a Web site could be found - representing 18 countries and 9 languages. Collecting information on each of over 150 sites was just the start of the process. The goal was to show the organizational groupings of the sites, the features they had in common, and the Web links between them. 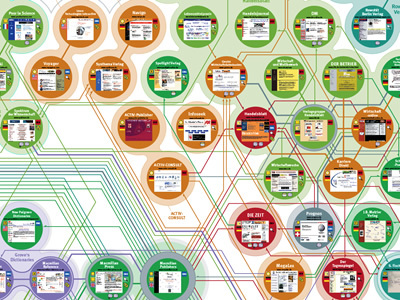 To communicate the complete scope of Holtzbrinck's Web presence, the designers at Dynamic Diagrams created a wall-sized diagram that shows all of the sites in one "Web map." When viewed in its entirety the Web map quickly reveals the group or groups to which each site belongs. Close up, the map provides information about each site's content, home country, language, and status. Inside each circle is an image of the site's home page. The diagram and a 200-page book containing a summary of each site were presented at Holtzbrinck's annual meeting in Stuttgart Germany in May 1999.